Home Our Garage Door Services Garage Door Maintenance Which Areas Of Your Garage Door System To Check Regularly? Most people are not familiar with the inner workings of garage door systems and tend not to go into detail when trying to understand the way these complicated devices function. Still, it is helpful to become familiar with the likely problem areas so that you can identify early signs of failure before they become larger problems that are more costly to deal with. Check the surface of the door for possible dents and rust. If you have a wooden door, there is a possibility that mold can develop and spread throughout your system. Clean the sensors well and check they are functioning properly by placing a broom in the path of the door and checking that the door reverses as it should. If it is malfunctioning, we strongly advise you to call a technician as soon as possible. Lubrication maintenance is important for all mechanical parts, especially the springs that lift the door. Regular lubrication this way is the surest method to keep your springs functioning for longer. They work alongside the springs in order to lift and lower the door. If they become loose or worn, the door movement may slow down, the door may not close properly, and tomorrow it may not even open. 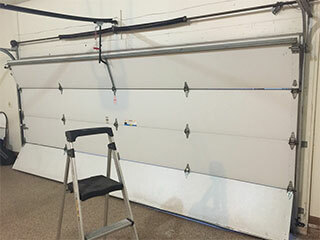 Considerably bent garage door tracks will become very problematic if the rollers are unable to slide properly – there will be a risk that the door comes off the track and you'll have an emergency repair on your hands. If your bottom weather-proofing is worn or damaged, you may be left with a gap beneath your door, living the space exposed to small animals and decreasing the energy efficiency of your property. Look out for damaged or considerably rusted mechanical parts – in particular, make sure the hinges are steady and there are no screws missing. Check the wires in the opener which can sometimes become worn and develop electrical faults. You should also pay attention to the level of sound your opener is generating – if you think it is getting noisier, this can be a sign that the motor gear inside of the opener is wearing out. Make sure the emergency release cord works fine in case the power goes out all of a sudden or in the event that you need to get the door open fast. There is no point having an emergency release cord if you don't know how to use it or if it doesn't do anything!